This is what Amedy Coulibaly told his hostages following his attack on a kosher supermarket in Paris on Friday. He also spoke to BFM-TV, claiming allegiance to Islamic State and saying that he wanted to defend Palestinians and target Jews. Coulibaly was subsequently shot dead by French police, but for the four Jewish shoppers he had already gunned down, rescue came too late. What happened in Paris should be a sobering reminder of what reckless statements of this nature can lead to. It is all too easy for allegations of collective guilt against a particular group to spill over into lethal acts of violence against individual members of that group, regardless of what they may or may not have done. 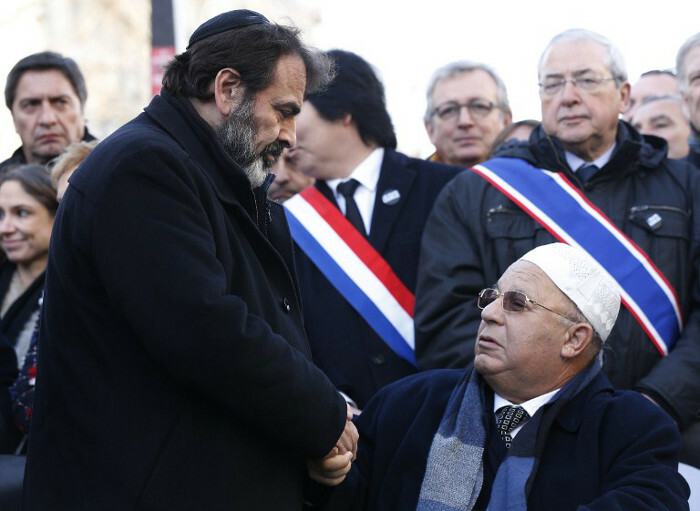 This was why four innocent members of the French Jewish community were murdered last week. Muslims likewise have good cause to object to the “collective guilt” notion, that is, that all Muslims everywhere are in some way answerable for the actions of their co-religionists, no matter where these occur. At worst, this can result in physical attacks on Muslim individuals or institutions. Since the Charlie Hebdo killings a week ago, for instance, more than 50 anti-Muslim incidents have been reported in France, including 21 cases of shootings and grenade throwing at Islamic buildings. Harassment can take other, more “benign” forms, however. One of these is putting pressure on Muslim leaders to actively speak out against atrocities carried out by other Muslims, even when these have taken place on a completely different continent. If such leaders choose of their own volition to condemn such actions, then well and good, but it is not for the general public to demand that they do so. Inevitably, there is an accusatory undertone to such demands, a sense of, “This is what your people are doing, what do you have to say about it”. Inevitably, it generates resentment, since no-one likes being told that they have to publicly apologise for something, whether it is for their own misdeeds or of those they are in some way associated with. Important as this point is, it should not be taken to mean that, in my view, moderate, mainstream Islam has no responsibility to confront extremism in its ranks. On the contrary, its leadership needs to be at the forefront of such efforts. But it is not for outsiders to dictate how this should be done. Rather, it is something Muslims have to deal with internally, and that will mean going a great deal further than issuing pro forma statements of condemnation. So frequent have terrorist atrocities become, and so global, that it is becoming all but impossible to keep up with them. No sooner has one outrage been committed than another occurs somewhere else. Thus, as people were getting to grips with the first terrorist attack on Australian soil, the seizure of hostages in a Sydney deli by an Iranian immigrant and subsequent death of two of them — news was received of 140 children murdered in a school in Pakistan. Sometimes, incidents take place simultaneously, resulting in some being noticed and others not. Serious as the incidents in France were, they should have been completely overshadowed by the latest Boko Haram atrocities in northern Nigeria, where, according to the latest reports, more than 2 000 people have been massacred. Quite rightly, Nigeria has complained bitterly about the relative lack of attention these events have been accorded in the international media. Evidently, a dozen or so deaths in a Western white-majority country are more newsworthy than the mass killing of thousands of black Africans. That we knew already, of course, as shown when hundreds of thousands of non-Muslims were dying in South Sudan. South Africa has hardly been unaffected, as shown by the murders of Pierre Korkie and of Pastor Werner Groenewald, and his two teenage children in Yemen and Afghanistan respectively. Like so many other incidents (who remembers, for instance, the 60-plus victims of the September 2013 Westgate Mall attack in September 2013? ), these tragedies are now all but forgotten by the general public. A further point always to bear in mind is that while people who are not Muslim make up a high proportion of the victims of Jihadi extremism, the majority of the latter — in Libya, Syria, Yemen, Iraq, Pakistan and Afghanistan particularly — are other Muslims. One of the common responses to the jihadi threat that doesn’t seem to be working is that of emphasising how moderate most Muslims are, and how the overwhelming majority of them abhor the acts carried out in their name by extremists every time a particularly appalling atrocity is committed by the latter. Certainly, it is crucial to make this point, given the danger that innocent Muslims might be targeted in random revenge attacks. But by continually qualifying any condemnation of Islamic extremism with careful assertions about the greatness of Islamic civilisation and of how a few unrepresentative criminals should not be allowed to besmirch its good name, is the so-called “moderate majority” not, to some extent, being let off the hook? It remains undeniable that, however unrepresentative they and their actions may be of mainstream Islam, those committing murder and mayhem in its name have emerged from the ranks of Islam. Aberration it may be, but having produced this monster, is it not ultimately up to Muslims themselves to deal with it? Shortly before the Paris murders, Egypt’s president, Abdel-Fattah el-Sissi, warned that the Islamic world was “making enemies of the whole world. So 1.6 billion people (in the Muslim world) will kill the entire world of 7 billion? That’s impossible … we need a religious revolution.” Unfortunately, El-Sissi himself enjoys little credibility as a spokesperson for the Islamic faith, given that he seized power in a coup against the democratically elected Muslim Brotherhood. His call will need to be taken up en masse by the religious leadership. Jihadists believe they are justified in killing infidels, heretic and other enemies of the true faith and that they will receive their reward in paradise for doing so. The message that mainstream imams, educators and academics within the Muslim world surely need to instil in their followers – and from an early age – is that the cold-blooded murder of innocents in the name of Islam is not a ticket to paradise but to an altogether different place. Thus far, it has to be said that this is not happening, or at least not happening to anything like the extent it needs to.